We Made the Front Page of the Press and Argus! 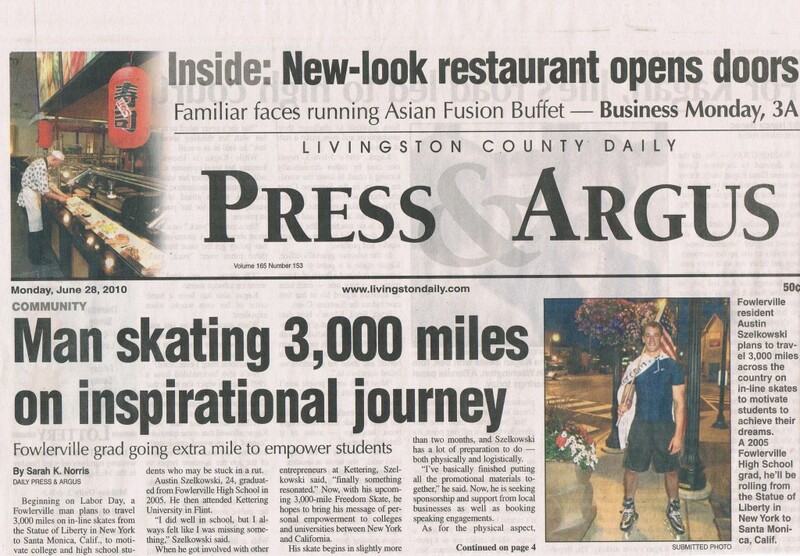 We made the front page of the Livingston County Press and Argus! Special thanks to Ben Owen! This video is a shout-out to my friends and fans as well as my sponsoring companies! Thanks so much! Thatâ€™s just it, I think. When you come to a place where your heart tells you that one way or another, your dream is going to come to life, you find a way. Iâ€™m learning to let go right now and to fall forward into this. I donâ€™t know if I chose this direction or if it chose me. Maybe it was neither, maybe itâ€™s just always been in me. All I know is that it is going to happen. Iâ€™ve never been so simultaneously terrified and emboldened as I am now. Stepping out to do something like this is something like taking a leap off of a cliff as paraglider; no one can tell you for sure that itâ€™s going to work, and the risk is high, but you know you will never feel the freedom of flight, if you donâ€™t give into the rush of the fall. Iâ€™m finding a new courage now, in a place that I didnâ€™t expect it. Iâ€™m finding it in the eyes of those that are beginning to believe in the direction that Iâ€™m going. Suddenly, Iâ€™m realizing that the reason why this must happen and will happen is that is not just my journey. It is a journey for every person who ever envisioned a life that was just a little to big, deep, rich, and free to fit into anyoneâ€™s box. There are people who have teetered all of their lives on the edge of their own freedom. Iâ€™m not trying to be a hero to them; I just want my leap to inspire them to take their own. Weâ€™re on the cusp of something here. I canâ€™t quite put a name to it, and perhaps it is yet to fragile to do so. What I will say is this: Whoever you are, and whereever you are, if you have dreams for a life that is far more than just ok, Iâ€™m skating for you. If you seek the courage to fall forward into the unknown, to embrace the energy that comes with being so alive in the moment that you canâ€™t feel fear, if you seek a life that we havenâ€™t quite known yet, I skate for you. I skate for you, because I know that the strength, the courage, and the passion necessary to make you fall forward into your own life already lies within you. I just want to help you to find it. The best way for you to help me? Tell anyone and everyone you can about this! The easiest way is simply to click â€œLike thisâ€ below to spread it to Facebook. Iâ€™m also trying to raise $200 to purchase a pair of the skates that I will actually be using for the journey (see â€œchipinâ€ box on top left). My current skates might just gobble me up!